Department of Research and Development, Nu Skin Enterprises, Provo, Utah, U.S.A. This chapter reviews the structure and function of the pilosebaceous unit and the controlling influences on the pilosebaceous unit and sebum secretion. The chapter is divided into three sections. 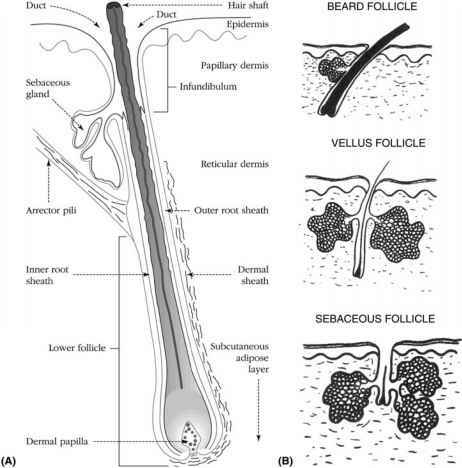 Section I gives an account of the structure and function of the normal pilosebaceous unit; Section II describes the biochemistry and regulation of pilosebaceous unit biology; and finally, Section III deals briefly with the biochemical changes occurring in the pilosebaceous duct in acne. In humans, pilosebaceous units or pilosebaceous follicles are found on all skin surfaces, apart from the palms of the hands and soles of the feet. 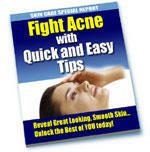 Essentially, they are invaginations of the epidermis into the dermis. Each comprises a duct, which ends in the dermal papilla, a hair fiber (or pilus) produced by the dermal papilla, a sebaceous gland and its associated sebaceous duct. The duct supports and protects the hair fiber and also drains sebum produced by the sebaceous gland and carries it to the skin surface. In addition, in split thickness wounds, the cells of the ductal epithelium are a source of proliferating keratinocytes, which migrate to re-epithelialize the wound (1). A specialized population of epithelial cells called stem cells, located in the bulge region situated below the sebaceous gland, are believed to be crucial for this (2). These cells are pluripotent and can also differentiate in some circumstances to produce ductal keratinocytes and sebocytes (3,4). Both the hair and sebum are products of pilosebaceous follicles, emerging onto the skin surface. Sebum is a holocrine secretion from the sebaceous gland cells or sebocytes, which means that the cells are destroyed when sebum is released. The function of sebum in humans is unclear, but as will be discussed later it may play a role in several skin functions (5,6). FIGURE 1 (A) Basic structure of a terminal pilosebaceous unit in anagen (growth phase). The hair penetrates deep into the scalp and the associated sebaceous gland is relatively small. (B) Structures of the different types of pilosebaceous units. The hair, sebaceous gland, and duct vary in size relative to each other. microdissection of skin, studies (8,9) appear to show that there is a spectrum of different sized follicles as compared to the three types described by Kligman. Neonatal pilosebaceous units begin as clusters of basal epidermal cells (pre-germs) that bud down into the dermis during the third and fourth months following conception (10). Budding is believed to be controlled by inductive messages, transmitted from the mesenchyme to the pregerms (11) and proper hair follicle development is dependent on a series of several inductive factors travelling between epithelial and mesenchymal follicle progenitors (12). Regulation of Wnt, ß-catenin, and hedgehog signaling pathways directs proper follicle morphogenesis, along with many growth factors including epidermal growth factors (EGFs), transforming growth factors (TGFs), bone morphogenic proteins, fibroblast growth factors (FGFs), and neurotrophins (13). Specialized mesenchymal cells accumulate beneath and around the pregerms and direct the elongation of the cells to form oblique hair pegs in the dermis. By approximately the fifth month, the pilosebaceous units are clearly visible and the keratinization of the duct begins. At this stage there are no follicular orifices. As cells in the center of what is to be the duct senesce, a central canal forms allowing the development of the hair fiber. The growth of the hair upwards removes the cellular debris from the canal and produces the follicular pore. It is believed that no new pilosebaceous units are formed after birth (14). However, recent work indicates that the epidermis can still maintain its capacity to produce follicles, if it is combined with embryonic trichogenic dermis by transplantation (15). Sebaceous glands form from the outgrowths of the outer root sheaths of hair follicles and are clearly visible by the 15th week of fetal life (16). The factors surrounding the development of sebaceous glands are complex, although there are data supporting a critical role for the hedgehog-signaling pathway. Thus, inhibition of hedgehog signaling blocked the development of sebocytes, while activation led to a striking increase in size and number of sebaceous glands in transgenic mice (17,18). In the embryo, sebum secretion contributes to the vernix caseosa and the amniotic fluid. During the neonatal period, sebaceous gland function is regulated by both fetal steroid synthesis and maternal androgens. At parturition, the sebaceous glands are well developed, largely due to the influence of the maternal andro-gens. However, during the first six months of life they become small and atrophic, remaining so until puberty, when they mature and become active under the influence of pubertal androgens. What structures are part of the pilosebaceous unit?